This week has had amazing weather. It’s ranged from 15-20°C and when sunny there is a nice, yet slightly cool breeze that makes it the perfect weather for walking around outside. When it gets overcast and rainy it can be a little damp and a sweater/light jacket combo is appropriate but it’s still really nice and comfortable temperature. This is what Norway is like in the summer. It doesn’t get unbearably hot and humid like here (well, maybe once and a while). When sunny it is warm and lovely, when overcast and rainy (and it can rain a lot at this time of year) it is damp and cool. This means you won’t be needing tons of tanks tops, and shorts, but things that can be layered if the weather fluctuates through the day. Scandinavian style is minimalistic yet edgy. They like to wear neutrals; most notably white, black, grey, and blue, but like to add a touch of colour now and then to the neutrals. So that’s what I did. I built the capsule around black, grey, and white, and added a touch of mustard yellow. This trip is for 10 days at the end of July – beginning of August. You will notice on rainy days that people in Norway will wear classic style rain slickers with yellow being a popular choice. You can find one here, here, and this one comes in a full range of sizes up to and including plus sizes. The will also be wearing a waterproof boot, and if it is not a rain boot they will sport something trendier but made to keep your feet dry, like the waterproof bootie above. Blondo has a variety of waterproof yet stylish shoes/boots in a variety of colours which are reviewed as a top rated travel shoes for style, comfort, and being both those while also staying waterproof. This list is based around city tourism. If you are going more into nature you’ll want to adjust it. Maybe add some long sleeves, leggings, a warmer coat, and a small backpack instead of a regular purse. 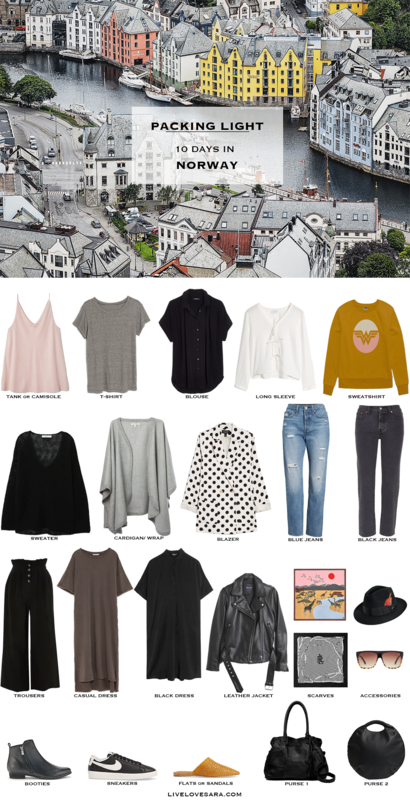 And if you are doing a combination of both then make a tentative itinerary so you can see how many days in the country vs city and plan your potential outfits around that. It will help you to adjust the pieces you want to include to suit your needs. For reference the longish grey t-shirt dress is one that I recently bought from Zara and I am in love with it. It is the perfect length and cut, for a comfortable casual vibe (and it has pockets!). I plan on getting the yellow version too. You can see it on me in my most recent Instagram picture here. Great Combos. I’m going on a 12 day Baltic cruise on June 2018. After it’s done… going to Dublin, Ireland. A total of 3 weeks!! I’m freaking out since we are from Miami,Florida on what to pack for so many days. Also the washing clothes on the ship is not an option as it is super expensive. Whats the best solution asides from Plain colored t-shirts and some jackets foe so many days?? Also, is there a convenient way to maybe wash some items of clothing once in Dublin? and where?? I think you can get away with anything as long as you make sure that everything coordinates well. So bring a crazy print blouse if you want but make sure it goes with your other stuff so you can make the most out of it. Travel outfits don’t have to be boring, they just need to be planned out well to make sure you will have as many outfit options as possible. As for laundry Ireland doesn’t really have many laundry mats like we know them, they have laundrettes which are drop off and pick up the same day laundry places. As for prices and which ones you can find a lot of reviews or suggestions on travel forums if you google “Dublin travel laundry options”. I read about one called All American Laundrette that is supposed to be good (It’s a basic place, but gets the job done) for around £10 which is a bargain. But there are quite a bit of suggestions. The other option is if you are staying in an Air BnB then to try to find one with laundry facilities. The trip sounds fab, and I hope you have great time! I also forgot to mention that if you don’t mind hand washing pieces, you could bring a travel clothes line (can be found for cheap on Amazon) and one of those super absorbent travel towels. Then hand wash, roll them in the towel to remove as much moisture as you can, and hang them to dry. At this time of year they should dry relatively quick. It’s great for t-shirts, and delicates.